IT IS REGARDED by many now as the highlight of the Indian classical music calendar, not just here in Britain but in Europe as well. Darbar, the festival that celebrates Indian classical music gets under way this week at the Southbank Centre in London, and passes a significant landmark. It is now 10 years old and more than 30 top musicians from the world of Indian classical music will descend on Southbank Centre between September 17-20. Among them will be sarod maestro Abhisek Lahiri, who spoke to www.asianculturevulture.com about his first major musical visit to the capital and his excitement at playing at Darbar. He is promising audiences something fresh and different, when he takes to the stage alongside tabla master Pandit Ramkumar Mishra. The two will play one half of the double bill, “Spirit of Hindustani and Carnatic Ragas” on Friday evening (September 18). 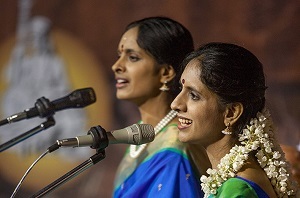 In addition to the purely musical highlights there will be a special dance programme by acclaimed British Asian Bharatanatyam icon, Seeta Patel, accompanied by an orchestra of classical Carnatic (South Indian style) musicians on the closing night. There is also a digital exhibition of rare instruments and a physical display too mounted in partnership with the Victoria & Albert Museum that opens today (September 16). A special symposium this evening will act as the launch event (September 16) for the display and herald the onset of Darbar. Even if you miss Darbar, there is another special muscial event on September 26 at the Hayward Gallery when celebrated musicians Ustad Irshad Khan, Sanju Sahai play “Midnight Soul Ragas“. Among the other major draws this year are Pandit Shivkumar Sharma who plays alongside sitar and surbahar maestro Ustad Irshad Khan. The recipient of one of India’s highest musical awards – the Sangeet Natak Academy – presented to flautist Pandit Ronu Majumdar – is also another one of the attractions. 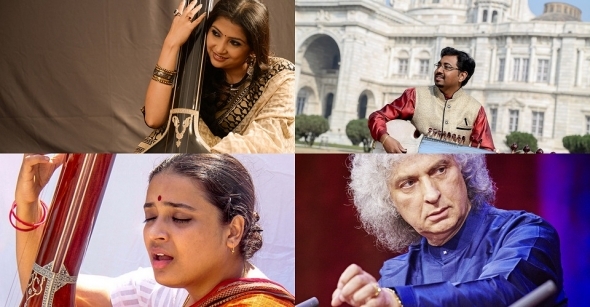 Vocalist Kaushiki Chakraborty, who won the 2005 BBC World Music award, makes it to Darbar this year, having worked with AR Rahman, and there are UK debuts for Mita Nag on sitar, and Pelva Naik, a dhrupad vocalist. For founder and Darbar director Sandeep Virdee, the festival is a mission, a tribute and a celebration all wrapped into one. He started it in 2006 in Leicester in tribute to his late father, Bhai Gurmit Singh Ji Virdee, a passionate tabla teacher. 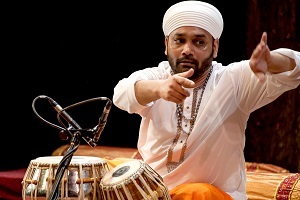 He said Darbar’s reputation had grown as it has focused on attracting the best talent from India and the UK in the Indian classical music tradition. “It’s unprejudicial curating,” Virdee argued. The classical music scene, moreover in India, can be affected by politics, rivalries and favouritism but Virdee, who gave up his career as an accountant to focus on Darbar and finding the talent for the festival, told us he was interested in securing musicians with high standards and a commitment to furthering the popularity of Indian classical music. 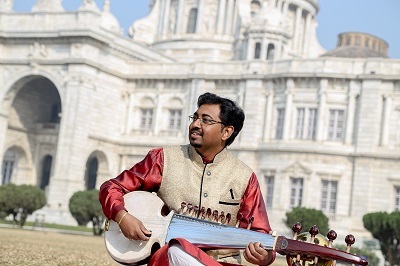 Just one of those on that very mission is sarod player Abhisek Lahiri. Speaking before he left India, he told www.asianculturevulture.com : “I want to spread my music to all corners of the world, that is main objective. “The sarod is such a magnificent instrument, you can play any type of music on the sarod, not just classical. Something of a veteran at 30, but with his best work very much still in front of him, he plans on making his Darbar debut special and memorable. Playing professionally since he was in his teens and initially alongside his father, who was also his guru (in the tradition a player will learn from an established musician), he has performed all over the world but never in a world-class set up in London and is thrilled by the prospect. Declining to go into precise detail as to what exactly he will play, he said his style is quite different to many classical Indian musicians. These gharanas developed and flourished during the rule of the Mughals and the princely states on the subcontinent in the 18th and 19th centuries and represent the place names of the famous courts. “I don’t play in just one style but all three. “My father learnt all these gharanas and my father is my guru. He taught me the intricacies of sarod playing in all these gharanas,” said Lahiri, who is based in Kolkata. It is fair to say that not all Indian musical connoisseurs would be comfortable by such an approach. Some believe in purity and eschew any deviation from tradition and form. But Abishek and his father have a different philosophy. “You cannot restrict music in the name of gharanas – if you can play the elements of all gharanas – why don’t you – why restrict yourself and say I belong to this gharana and don’t want to play that one – no one has a copyright over it. Lahiri and his father enjoy the accolade of being the first Indian classical musicians to ever play in the European parliament in 2002 and were invited to represent Indian classical music in Canada on one of its culture days, celebrating minority communities in October in 2007. Abhisek himself performed internationally when he was no more than 14, appearing at the World Kinder Music Festival in Holland. A children’s musical festival, it become a turning point for him. He has been on some 21 European tours and has also played in the US, Japan and Bangladesh. He said Indian classical music continues to attract healthy audiences and he has noted a change over time too. “My experience playing outside India has been very good thanks to our great masters such as Pandit Ravi Shankar, Ustad Akbar Ali Khan, Ustad Ilyas Khan and Zakir Hussain. “They have popularised Indian classical music so much in the West nowadays that I don’t need to introduce my music or my instrument to the audience (any more). He said in countries like the US and the UK where there is a significant diaspora, audiences remained strong and engaged. A musician who enjoys collaborating (in recent times he has worked with flamenco musicians), he believes you learn and grow by coming into contact with other styles. Darbar audiences, you have been warned…you’re in for a real treat! Darbar is supported by the Arts Council England and is organised in association with Sky Arts and features on BBC Radio 3. 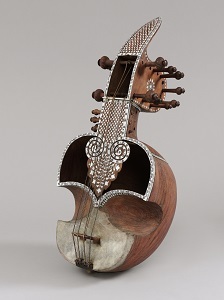 FROM TODAY (September 16-October 31): Musical Wonders of India, a digital exhibition by the the V&A, displaying online the 19th-century instruments from the V&A’s collection and can be seen alongside contemporary musicians playing instruments of a more modern date with interviews with the musicians and experts. You will be able to see some of these instruments in the Nehru Gallery and there will be live performances too. Check the V&A website. 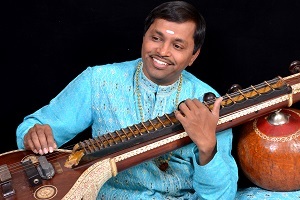 Saraswati Veena and The Percussion Masters (double bill concert), Purcell Room, Queen Elizabeth Hall (QEH), 6.30pm. Spirit of Hindustani and Carnatic Ragas Purcell Room, Queen Elizabeth Hall 6.30pm (Sold out but check where stated). Indian Afterglow: Midnight Soul Ragas, Ustad Irshad Khan, Sanju Sahai, Hayward Gallery 8.15pm.